According to studies by a layer industry expert, productivity losses can reach €0.57 per hen per year in case of moderate mite infestation and up to €2.50 in high infestations.2 Current management methods lack sufficient efficacy to keep mite infestations under control at many poultry farms, and often pose safety threats for both birds and humans. Larvae hatch with six legs and do not feed. After the first molt, both nymphal stages and adults have eight legs. Protonymphs, deutonymphs and adult females routinely feed on host blood, but males only occasionally feed. Once on a host, mites feed for short periods of up to an hour, doing so every two to four days and typically during periods of darkness. 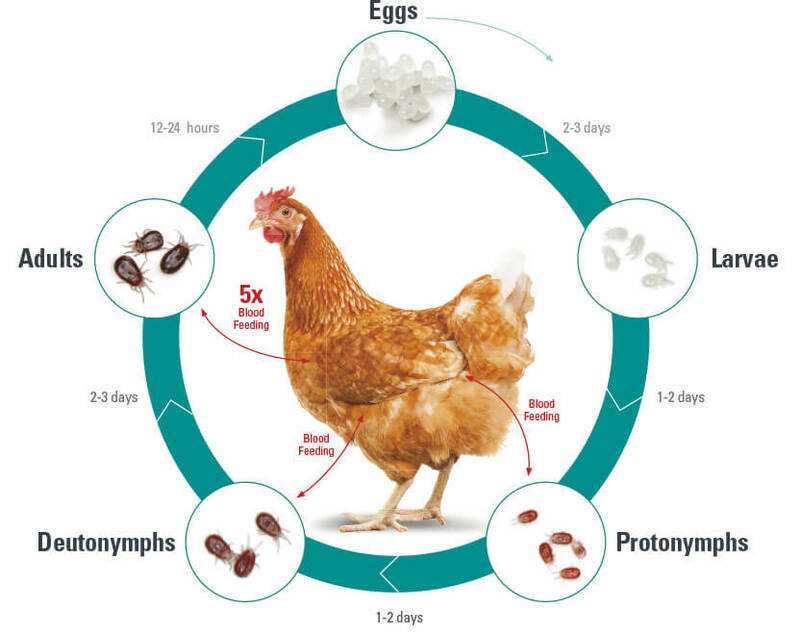 Complete development of D. gallinae, from egg to adult through one larval stage and two nymphal stages, typically occurs from 7-10 days up to two weeks.3 Poultry house conditions are well suited to red mite population growth, as temperatures between 10ºC and 35ºC and high relative humidity (>70%) facilitate reproduction and development. 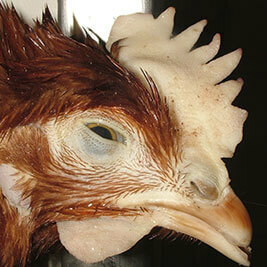 In addition to spreading disease, infestation may limit hen immunological responses to pathogens. 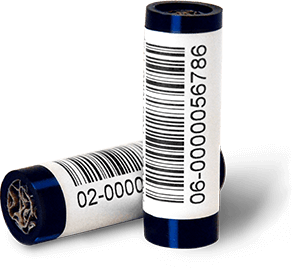 Heavy infestations are reported to reduce antibody titers to some viral vaccines or suppress host antibody production. 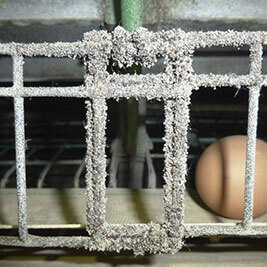 Although causal factors may vary, in extreme cases poultry red mite numbers may be so high that hens become severely anemic, with mortality resulting from exsanguination. 2 Mozafar F. 2014. Die rote vogelmilbe, eine grosse herausforderung für eierproduzenten. Frühjahrveranstaltung;Deutchen Vereinigung für Geflügelwissenschaft. Leipzig, 11-12 März 2014. 3 Sparagano O.A.E., George D.R., Harrington D.W.J., Giangaspero A. 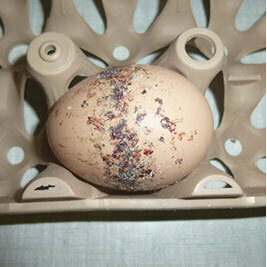 Significance and control of the poultry red mite Dermanyssus gallinae. Annu Rev Entomol 2014; 59:447-466. 4 Sommer D, Heffels-Redmann U, Köhler K, Lierz M, Kaleta EF. Role of the poultry red mite (Demanyssus gallinae) in the transmission of avian influenza A virus. Tierärztliche Praxis Grosstiere 2016; 1:47-54. 5 Kilpinen O. 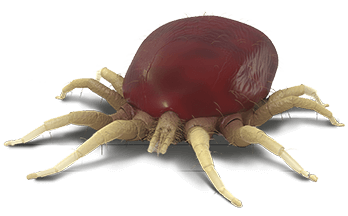 How to obtain a blood meal without being eaten by a host: the case of poultry red mite, Dermanyssus gallinae. Physiol Entomology 2005; 30:232-240.